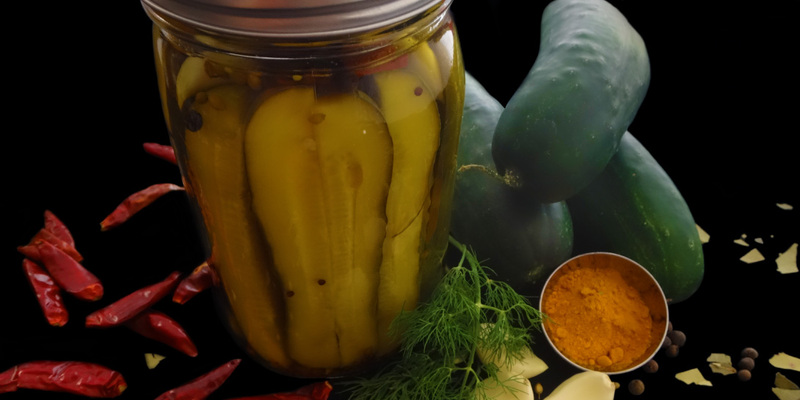 These awesome vegan pickles are a wonderful addition to your refrigerator. Unlike most pickles, these crunchy little garlic bombs will not disappoint! These pickles are simply the best. Lucky for you, they also happen to be quite easy to make. Most pickles that you can buy at the store are not as good as these because the store-bought jarred ones are generally pasteurized, which involves cooking under pressure at a minimum of 240ºF. While this kills off potential botulism spores, it also significantly alters and destroys most of the aromatics from the pickling spices, garlic, and dill. The method used here involves much cooler temperature, which preserves the wonderful flavors from the pickling spices, garlic, and dill. Pasteurized pickles are safe stored unopened at room temperature but these are not. Don’t be overly-paranoid though; the acidic pH of the brine (thanks to the vinegar) makes these safe for up to about 2 months in the refrigerator (botulism doesn’t like acid). As long as you store these pickles in the refrigerator and consume them within 6 weeks, you will be perfectly fine. I have written this recipe to include a little bit of extra brine, just in case you spill while filling the jar. Vinegar, distilled white 250 g 1. Combine and bring to a simmer with the lid on. Mustard seed 3.5 g 2. Add to vinegar mixture and simmer 20 minutes with the lid on. Cucumber, pickling, quartered lengthwise, room temperature 400 g 3. Place ingredients in a 1 L mason jar. Garlic clove, whole 35 g 4. Add spiced vinegar mixture to the mason jar leaving 2 cm headspace. Dill, sprig 4.0 g 5. Seal and invert jar for 3 hours at room temperature. Red chiles, dried 4 g 6. Refrigerate upright for one week prior to serving. Keep for up to 6 weeks refrigerated.